Hi. I'm excited-we finally are getting some fall weather. Cool mornings and nights. Yeah! Today I thought I'd share some random kitchen pictures. I've been trying to go more neutral in my decor, so I can add in pops of color. I've also been trying to add some farmhouse touches to the kitchen. I found this cute Yeast box while antiquing. It works perfectly for my olive oil, salt and pepper by the stove. This is an old wood puzzle piece, that has magnets on the back. 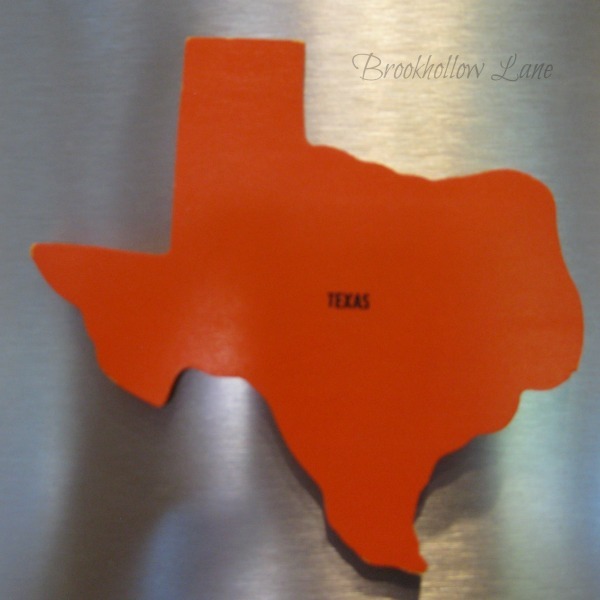 I added it to the fridge, for a pop of orange in the fall. I love this caddy. It serves 2 purposes. One, the obvious-holding napkins and flatware. Two -it serves as a doggie blockade from the window seat, that's right next to the counter. One day, Bowie decided he could make that jump, and I found him checking out my counter. I can't have the little guy doing that. Anyway, it works. No more dog on counter. Last, I found this pig cutting board, that had already been chalk painted. I decided to do something with it. Drilled a hole, and added a battery clock kit. By the way, I painted the hands white, because all they had was brass. I may tweak the numbers a little, I will show it to you next time, when it's hung above the door. Lastly, I tore apart a cutter quilt, and made a few zipper bags out of the hand sewn squares. I love reusing old stuff, and making it into something new. I'll be adding these to my Etsy shop soon. Lot's of randomness going on here. I'm enjoying the weather so much. Hope your week turns out to be a great one. I love the warm wood tone of your old yeast box, and your pig cutting board/ clock is adorable! I like the flower and mushroom details on your zippered bags- so sweet! Our leaves are falling rapidly and we've already had a 15 minute snowstorm. Enjoy your cool autumn weather! Vickie I can't believe you had a little snow already. I am so enjoying fall at last. I feel like celebrating-COOL WEATHER! Thanks! Very cute piggy clock and I love to use old wood boxes. I'm enjoying everyday we get. Today it was 76!!! I'm loving mixing in old wood stuff. I probably had some things like this years ago, and now here I go again. 76 sounds perfect, Deb. We'll get there soon. Hi Leslie, Love the yeast box you found. What a treasure. 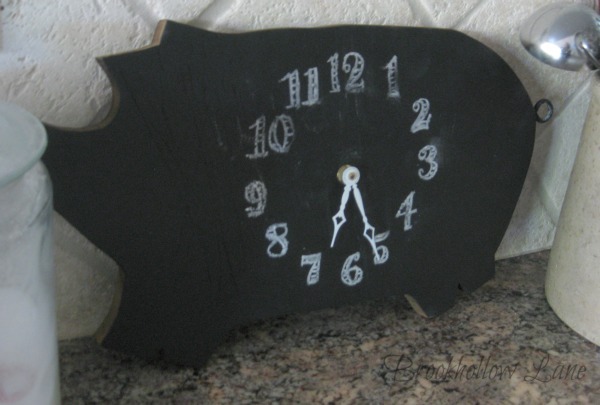 What a darling pig chalk board turned into a clock. What a great idea and so creative. You are so talented. Love the adorable quilt bags your designed too. Had to smile at the thought of your fur baby up on the counter!! Darling tote box you added. Yes, isn't our weather great??? I am loving the cooler temps at night and in the mornings. Have a great week. Thanks. I thought it was funny about Bowie on the counter at first, until he had his nose in the butter that was on the counter. I had to figure something out. Yikes! Yes , and yes about our lovely fall weather. It takes so long to finally get here, it makes it even more special. You have a great week too. Hi Leslie, it was 73 here yesterday and I wanted to dance I was so happy! Short lived though, I think we're back to the 80's today. Bo is amazing to be able to jump up on your counter (wonder what others acrobatic feats he's dreaming about?!) - my parents had a terrier mix who could jump over a six foot fence. Love your yeast box and all your craftiness, so darling. Happy week and lovely Fall to you! You lucky for such nice weather. It's really nice here right now -but still in then 80's. Aren't dogs the funniest things? I never thought he'd think of jumping over to the counter-but I was wrong. Happy Fall to you too! I only wish it would stay 73! We've had a lot of triple digit days and days in the 90's and I'm sure it's not over. It's pretty much been summer all year long. And people say climate change doesn't exist, the ninny heads. Yes, that's a little cross stitch kitty on my mini sampler. It's a part of a free chart on someone's blog in the past few years, I thought it was so cute. At first I stitched the larger one from the chart but it was too big. 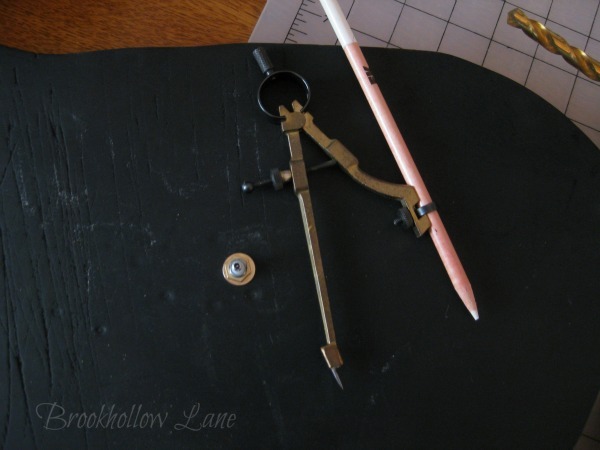 Are you making Christmas ornaments for your kids this year? I loved seeing them, so darling. I used to cross stitch, but haven't in years. Your little kitty is just adorable. I am making ornies for the boys. I haven't started yet, but have some ideas. One son is moving to Seattle-probably do a space needle ornie. I'll check out your IG. Thanks! The weather is still nice here as well. I love what you did with your pig cutting board. Thanks, Magali. Glad your weather is nice. I think Bowie and Shadow would get along great! Although he would fight for the cozy nook! 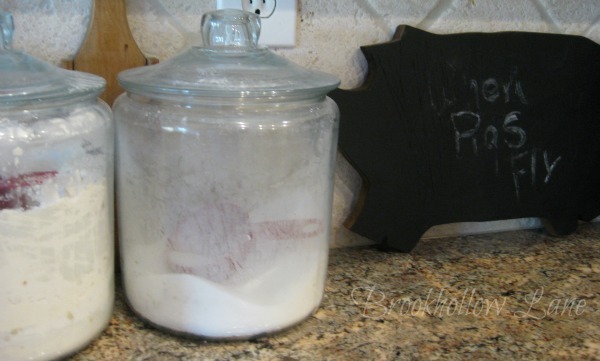 What cute things in your kitchen! It's truly fall here and getting colder every day. We're even supposed to get a freeze Saturday night! Thanks so mch for popping in to see me. Nice to have you over here, Shelia. Just raining here, no cold weather yet. Happy Fall! Thanks BJ. I'm safe at home. You be careful too-lots of flooding going on. No, that is a real treasure BJ. I just love mine and I'm sure you love yours too!